SHI will release the new books at a book signing on Friday, Sept. 8, at the Walter Soboleff Building in Juneau. The books follow on the heels of 11 other Baby Raven books SHI has published since 2016. The institute plans to publish three additional books in October (“The Woman Who Married the Bear,” “The Woman Carried Away by Killer Whales” and “Am’ala”) and two more in November, bringing the total number of books published during the three-year program to 20. All Baby Raven books are distributed free of charge to families enrolled in the program. They may also be purchased at the Sealaska Heritage Store and online. The new books will be available for purchase on Sept. 8 at the book signing. Illustrator Janine Gibbons and author Frank Katasse will attend a second book signing in October when their books are released. Shanyáak’utlaax: Salmon Boy: After a Tlingit mother gives her son a dried piece of salmon with mold on the end, he flings it away in disgust, committing a taboo. This offends the Salmon People, who sweep him into the water and into their world, where they name him Shanyaak’utlaax or Moldy End. Find out what happens to Shanyaak’utlaax in this ancient Tlingit story. Written in Tlingit and in English, edited by Johnny Marks, Hans Chester, David Katzeek, Nora Dauenhauer, and Richard Dauenhauer. Illustrated by Tlingit artist Michaela Goade. Audio for this book is available on SHI’s website at http://www.sealaskaheritage.org/institute/education/resources. 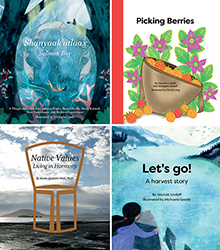 Let’s Go: A Harvest Story: Learn about Southeast Alaska Native subsistence activities and foods in this original text by Hannah Lindoff, illustrated by Michaela Goade. Readers travel on a journey through the seasons while exploring Native traditions, cultural values, and the beautiful and bountiful Southeast Alaskan landscape. Picking Berries: Discover the different types of berries that grow in Southeast Alaska while also learning the names for berries in Lingít (Tlingit language), Xaad Kíl (Haida language) and Sm’algya x (Tsimshian language). “Picking Berries” features original rhyming text by Hannah Lindoff and colorful, place-based illustrations by Tsimshian artist David Lang. Native Values: Living in Harmony: Explore the Four Core Cultural Values of the Tlingit, Haida and Tsimshian of Southeast Alaska; told by Tlingit Anthropologist and President of Sealaska Heritage Institute, Rosita Worl, Ph.D. This book is part of the award-sinning Baby Raven Reads, a Sealaska Heritage program for Alaska Native families with children up to age 5 that promotes language development and school readiness.